Especially if you are going to have a complex trip - multiple flights, hotels and locations - TripIt will save you timing and lot of separate pieces of paper to carry on. Simply forward all different confirmation emails you get from travel agencies, airlines, trains, hotels and rental cars and TripIt will prepare for you a single document with all details there. But it’s not all! TripIt will add automatically maps, directions and weather to your itinerary and you can add by yourself text, for example addresses of shops, reviews of restaurant you’ve copied on other sites or whatever note you could need. If you can also share the itinerary with other people - great to coordinate trips with your colleagues - and access your trips via your mobile phone. 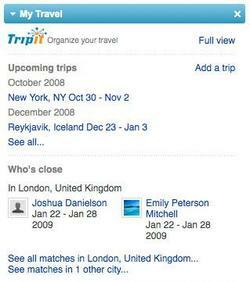 TripIt is an excellent tool to make your travel easier! Give it a try.